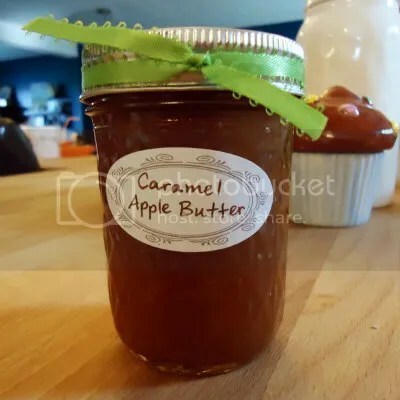 Making apple butter has become a fun Mother’s Day tradition for me, a yummy homemade gift to share not only with Mom, but also with several close friends who consistently bless me in my own beautiful, complicated parenting journey. This year I decided to spice things up a little bit by making a variation of one of my all-time favorite flavors, caramel apple. The inspiration for this recipe came from one in Paul Virant’s fantastic cookbook, The Preservation Kitchen. 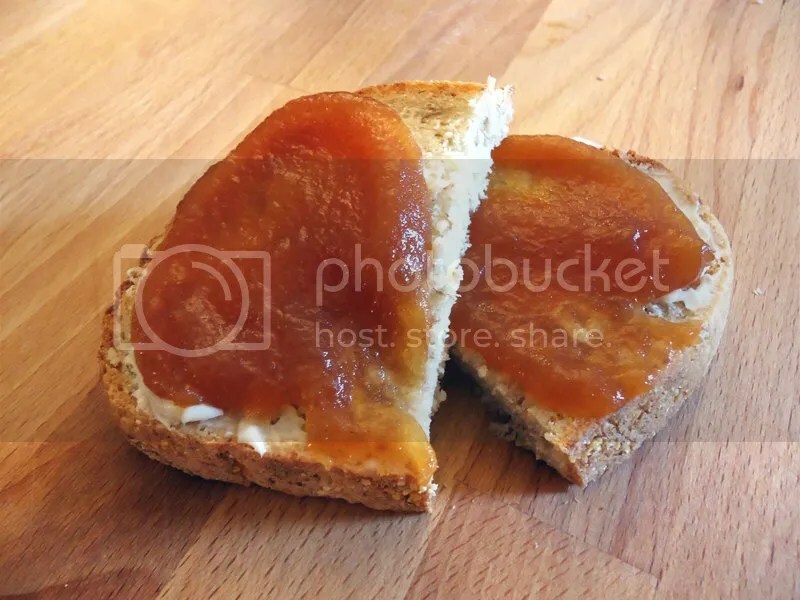 His Caramel Apple Jam is a savory shredded apple preserve, flavored with thyme and black pepper, but it begins the same way: by making a deep amber, intensely apple caramel. There we parted ways, as I added chopped apples, cinnamon, clove, and nutmeg, then reduced and blended the mixture into tangy, sweet fruit butter. 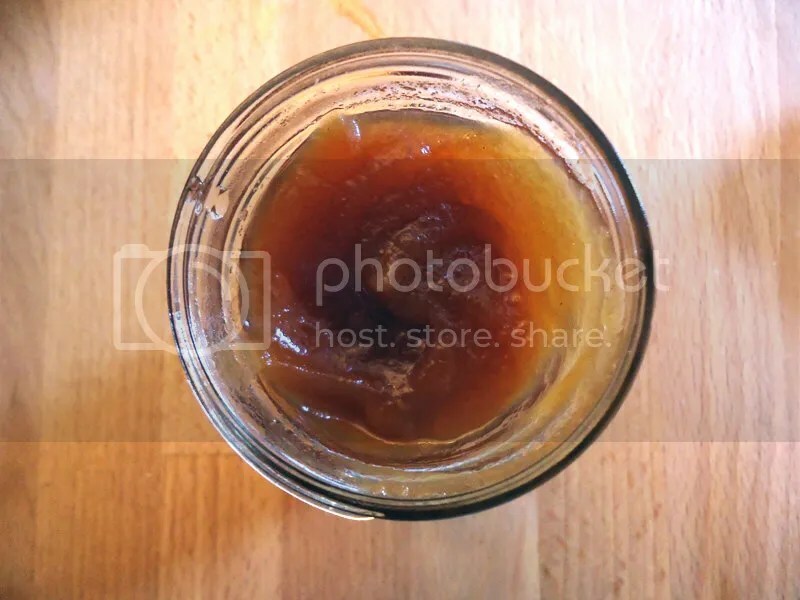 Caramel Apple Butter contains the same amount of sugar and apple juice as traditional apple butter, but the caramelization process brings out the warmth of both. 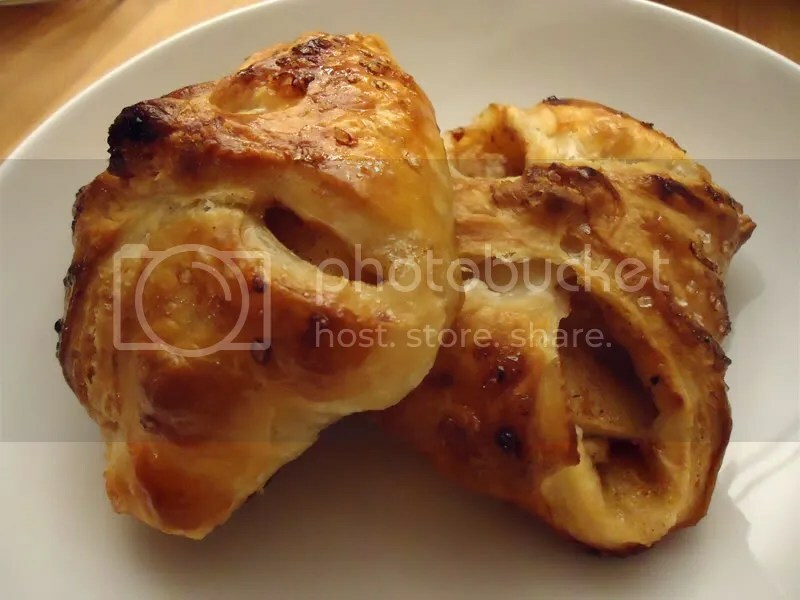 The results are thick and velvety, equally at home slathered on a ginger scone or a grilled turkey and cheese sandwich. I love apple butter on pancakes or cheddar biscuits, and it makes a beautiful sauce for roasted pork loin when added to the pan juices with a bit of grainy mustard. 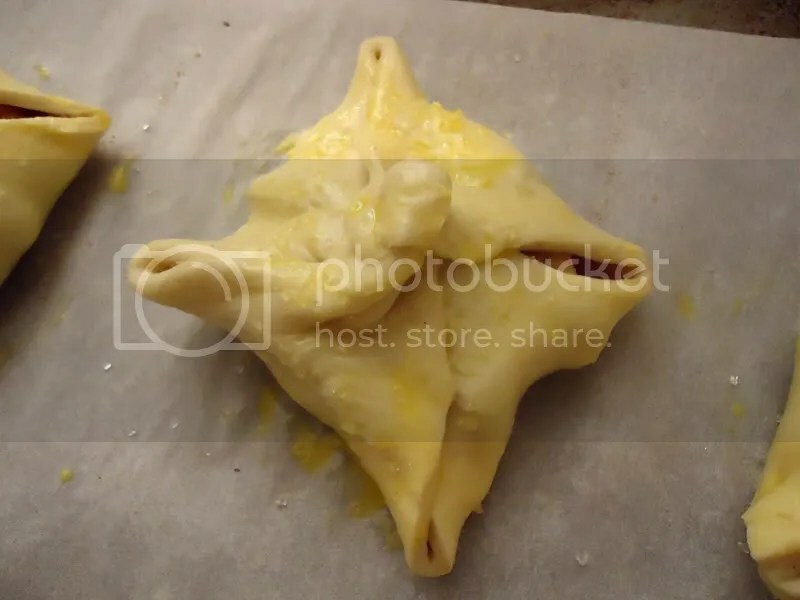 A note: this cooking process is not one that lends itself to multi-tasking; although not complex, it requires some time and attention. Because making caramel involves hot sugar, this also isn’t a good time to invite little ones into the kitchen. Canning preserves is an ideal late Sunday afternoon activity, just right for when the house is quiet, everyone is absorbed in their own tasks, and the kitchen is otherwise empty. I love this hour of productive peace, with nothing more urgent to do than stir caramel and enjoy the fragrance of warm apples. Because I am a kitchen romantic, I also like to think that a little of my calm and focus seeps into what I am cooking, and what mom couldn’t use more of those? The sugar will turn crispy and crackly, then finally begin to ooze into a pale brown syrup at the edges. Once this happens, begin stirring with a wooden spoon, and continue to stir as the sugar melts completely. Once all the granules are dissolved, allow sugar to caramelize another 5-7 minutes, until it’s deep, dark amber in color and smells rich and nutty. Do not taste or touch it, as hot sugar burns are very painful. 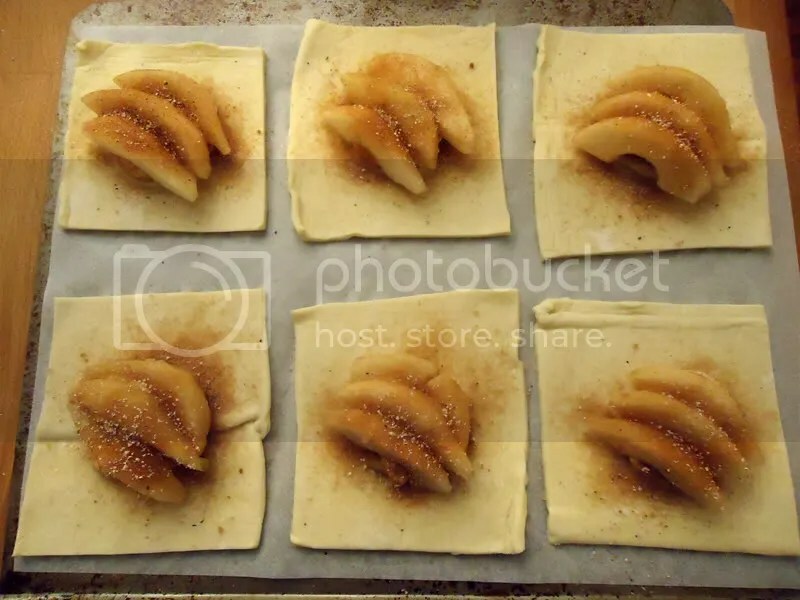 Once the sugar is caramelized, remove it from the heat and stand back a bit as you pour in the apple juice. Once your caramel geyser quits bubbling and frothing enough to safely approach, return it to the heat and stir. The caramel will have crystallized into a solid lump in the bottom of the pan, but patient stirring will help it dissolve again. Continue stirring constantly as the apple juice caramel simmers and reduces by half, about fifteen minutes. Add the salt and ground spices and stir another minute or two to thoroughly combine. Once the spiced apple caramel has thickened, it’s time to add the fruit. 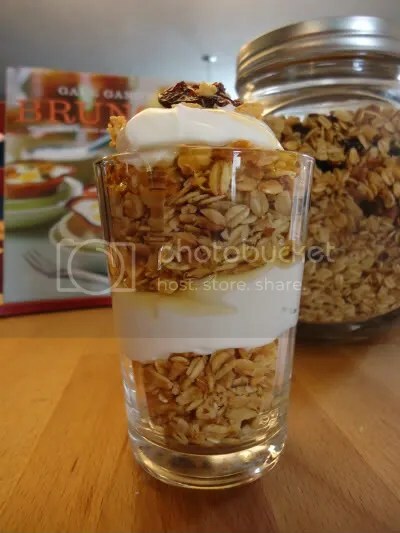 (Quick tip: For practicality’s sake, I often peel, core, and chop the apples the night before, toss them with the juice of a lemon, and then refrigerate until ready to use.) Stir in the apples and cover until it comes to a boil, then simmer uncovered for 30-40 minutes, until apples are very tender and liquid has further reduced. While apples are cooking, use a water-bath canning pan to immerse eight half-pint jars in water and heat for ten minutes. (I use a 21 1/2-quart pan and rack, available for less than $20. I also use a set of silicone-lined jar tongs and a wide-mouth funnel, available individually or as part of a set.) This heats the jars enough that the hot apple butter won’t crack the glass. 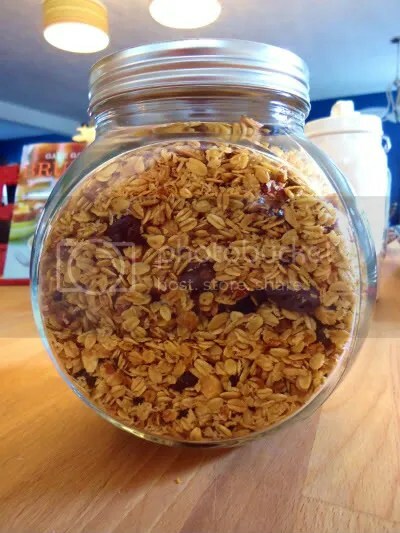 Once blended smooth, use a funnel to fill heated, dried jars, leaving 1/2″ of space at the top of each jar. Screw on the bands and lids, then process your jars by immersing in boiling water bath for ten minutes. 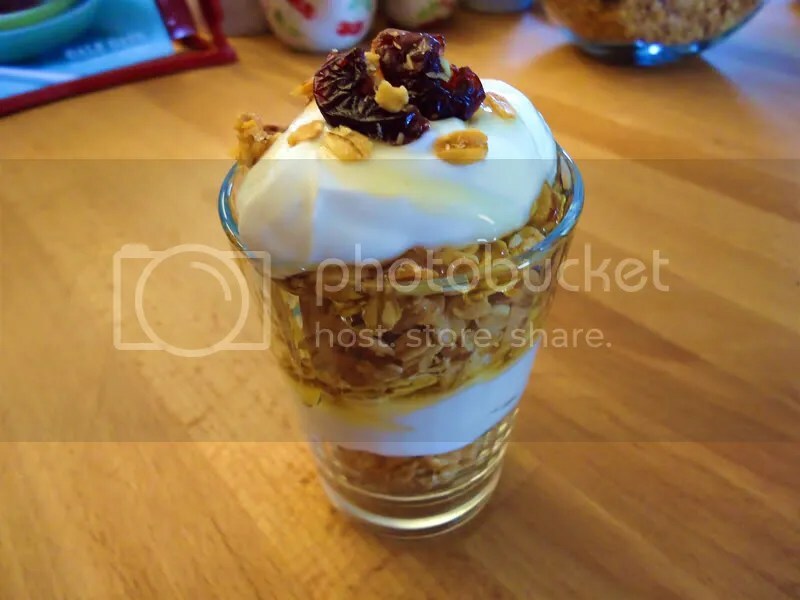 Remove the sealed, processed jars to allow them to cool. When the lids make a popping sound, you know they’re sealed tight. Unopened jars of apple butter can be stored at room temperature for up to six months, but they should be refrigerated after opening. If a jar doesn’t seal after processing and cooling, the apple butter is fine, but it should only be kept in the refrigerator. 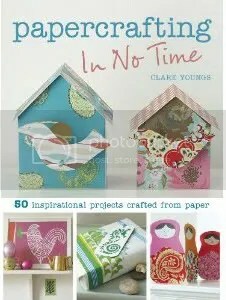 My book reviews usually trend toward papercrafting and multimedia collage, with a healthy dose of whimsy thrown in for fun. Depending on your point of view, Mini Weapons of Mass Destruction 2: Build A Secret Agent Arsenal could be said to combine all three. Regardless of its genre, it has kept my 15-year-old son and I occupied and inspired for many afternoons. 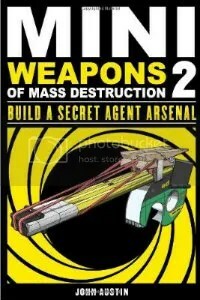 Imagine Macgyver and James Bond trapped in an office supply store, and you have a good idea of the projects featured in Mini Weapons 2. The projects require a selection of cannibalized office supply parts (ballpoint pen housings, disassembled binder clips, empty glue stick tubes, and mechanical pencil innards, to name a few), held together with liberal amounts of hot glue and duct tape. The mom in me appreciates that we have such an entertaining way to re-use all the flotsam of everyday life, from orphaned pen caps to empty tape dispensers. The dried-out highlighter that used to go in the trash now gets harvested for parts: its housing is the Golden Gun barrel, and its cap becomes the sight on a Shark with Laser Beam. How can you resist a book that reminds you to save the cap of your used glue stick for a Q-tip blowgun? 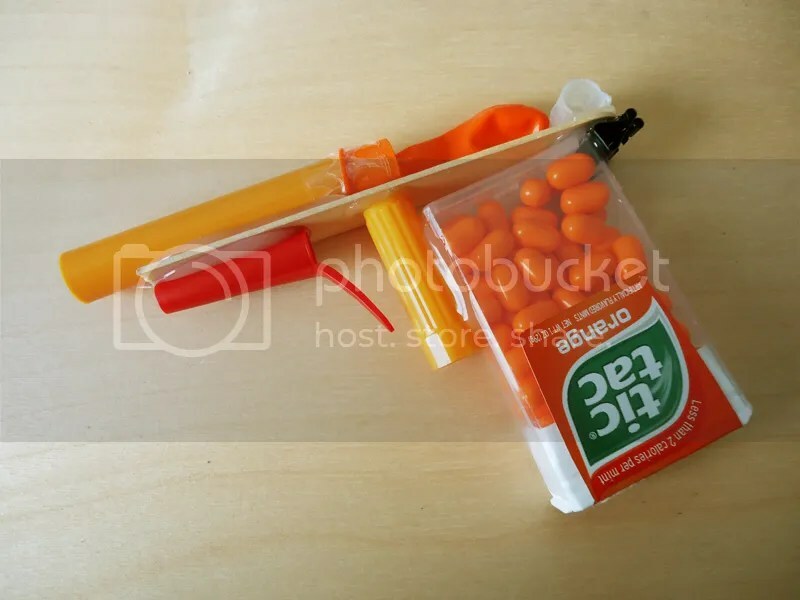 Our most recent creation is a candy-calliber PPK that fires balloon-propelled Tic-Tac ammo at distances of up to eight feet. (Not exactly deadly force, but enough to fuel energetic gun fights that send candy flying and our toy poodle scurrying for cover.) 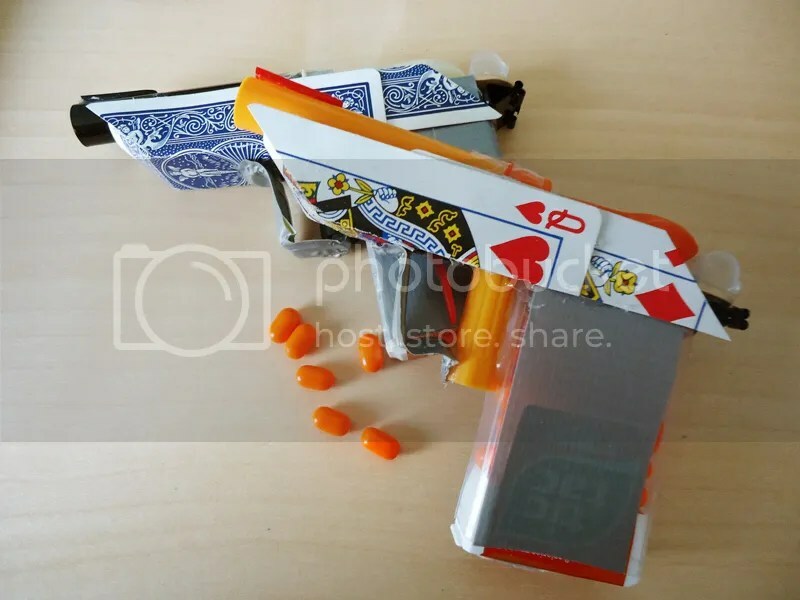 The picture below, taken mid-assembly, gives you a good idea of the sort of items used. 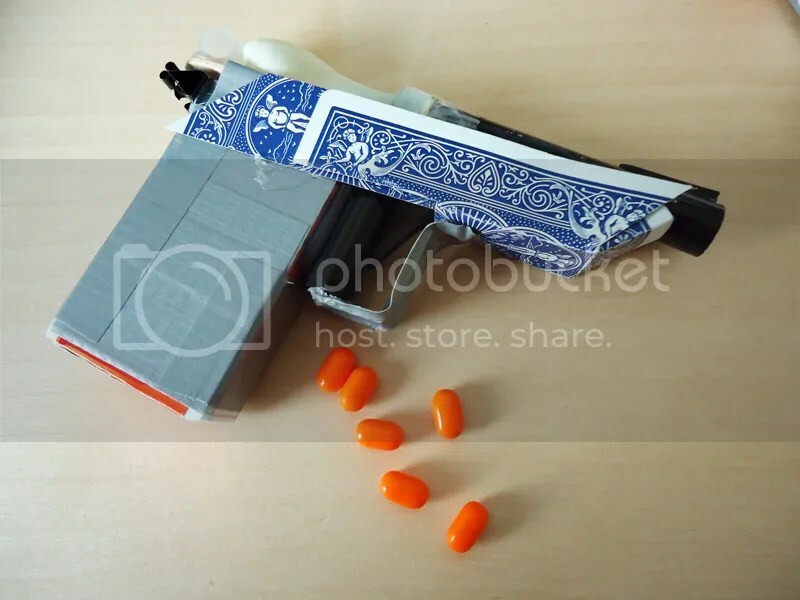 Right now, we are saving up pieces for the Rubber Band Derringer and a mini-Bowler Hat Launcher that would make Oddjob proud. If we don’t have all the supplies needed, a quick trip to the dollar store always suffices, but we try to use what we have on hand as much as possible. 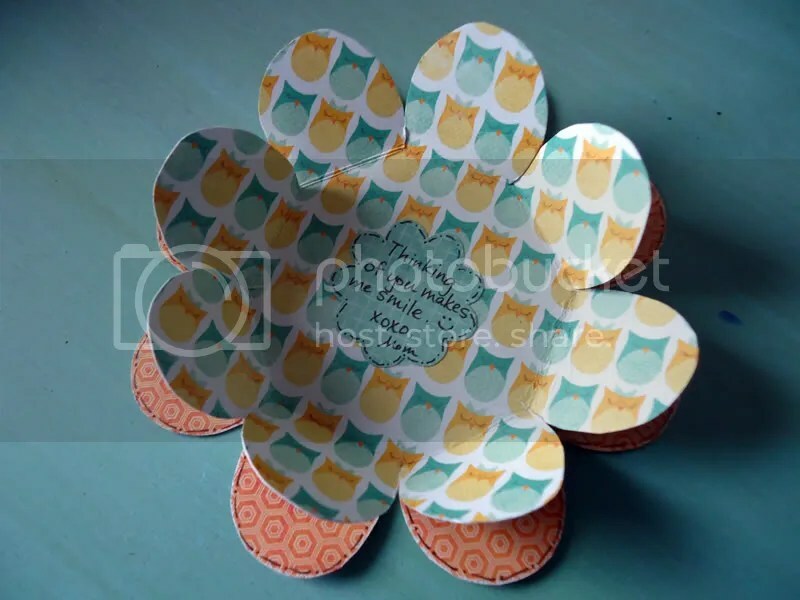 This is another project from Margaret Van Sicklen’s fantastic Modern Paper Crafts. 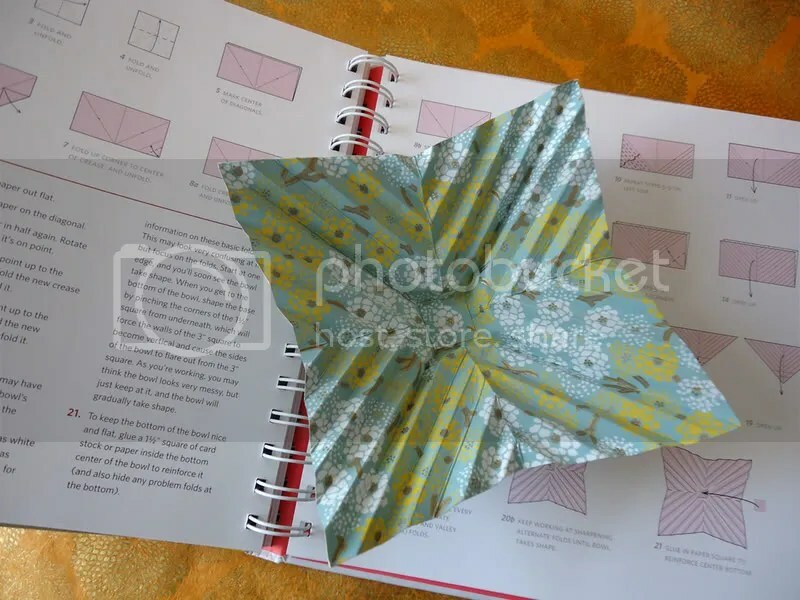 Like the pleated paper bowl I made from the same book, this also required some complex paper folding and a delicate-but-determined touch. 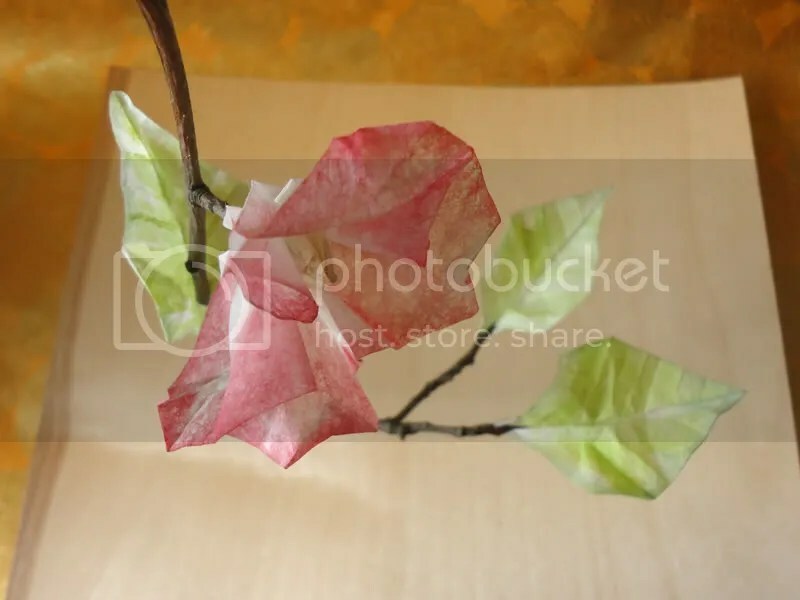 I found the leaves much simpler to make than the blossoms, but the instructions were clear and detailed enough to get me through it without frustration. 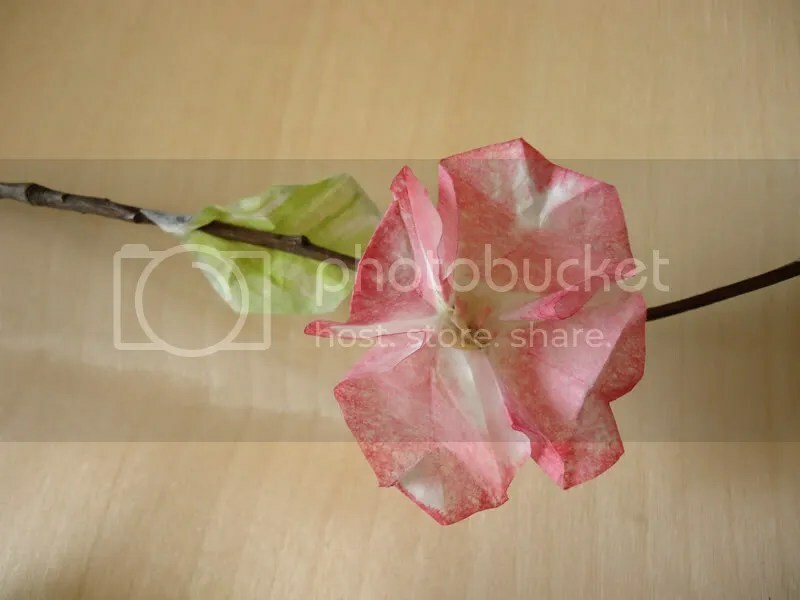 And the nice thing about a paper craft with coffee filters is that your raw materials only cost a few cents, so it’s no great loss if (when) you have to start over. Watercoloring the blossoms and leaves also required a gentle hand, but I love the effect gained as the paint bleeds into the fibers of the filter. I used to make watercolor coffee filter art with my kids when they were little, so this was a sweet reminder of those early homeschool years. My son and daughter are more complicated creatures now, but we all still revel in doing art together. In the end, that is what my plum blossoms speak to: fondness and nostalgia for a more innocent time, determination to get through winter’s challenges together, and growing hope for the future. I think that’s a pretty good way to end February. When they stocked some gorgeous new handmade Lokta, I knew it merited a special project. Lokta is a paper made in Nepal from the bark of the Lokta bush, and the strength of the fibers combined with the light weight mean it folds beautifully. 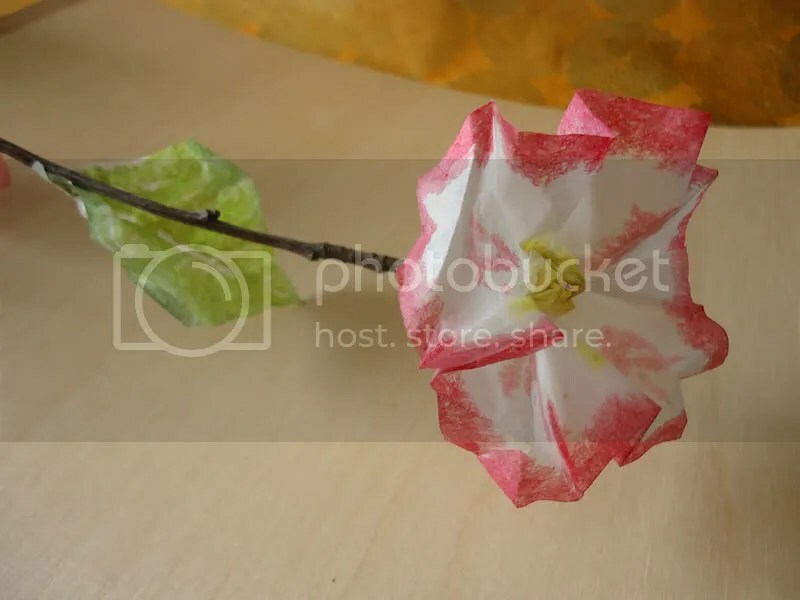 There is also something undeniably romantic about folding paper that was crafted in the heights of the Himalayas. 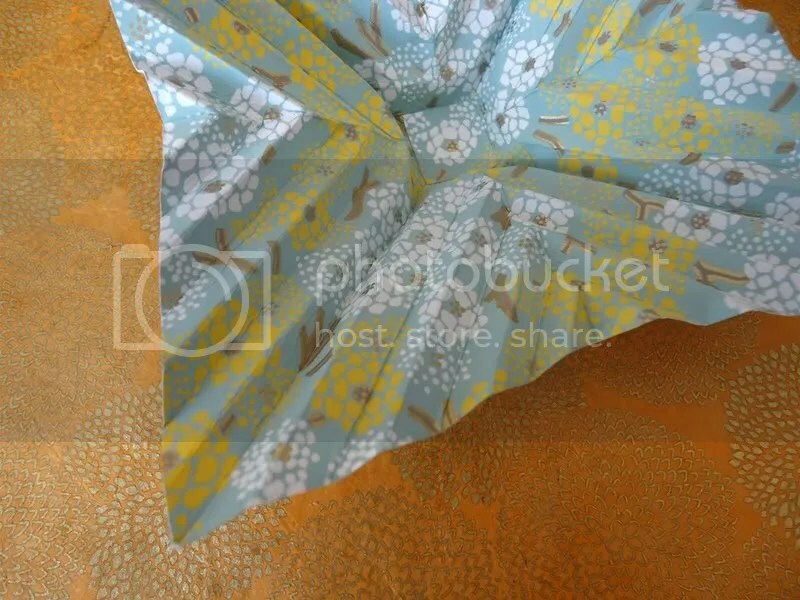 I chose a sheet printed with delicate butter yellow and white chrysanthemums on gold stems, layered over a pale aqua background. 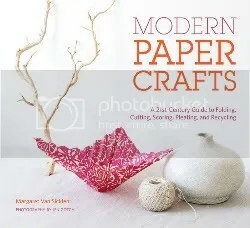 I wanted a project that would really showcase the paper, and my mind immediately went to the piece featured on the cover of Modern Paper Crafts, one of my favorite additions to my art book collection last year. 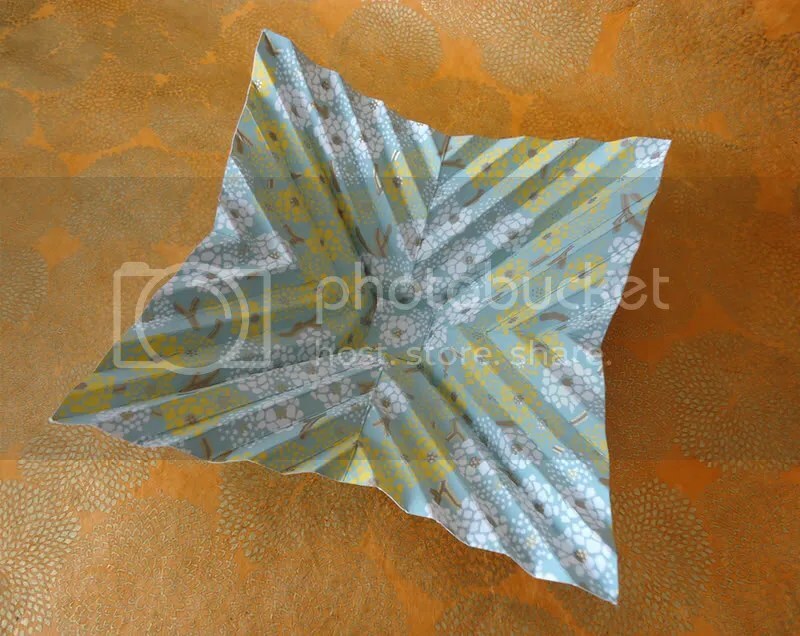 The title features sections on folding, scoring, cutting, pleating, and recycling paper, and this pleated paper bowl was one of the highlights for me. I like to practice intricate paper crafts on more pedestrian paper before I attempt the real thing. Because a lot of this project was about perfecting the pleating technique, it made sense to take the time for a dry run and get my hands used to the folding and scoring motions. I made my test bowl from some Alice in Wonderland scrapbooking paper, twice the size of the final 6″-square Lokta bowl I had planned. If you examine the underside of the paper, you can see how the base and sides are formed. It required a lot of precise folding, but after one of those weeks that tested me both emotionally and physically, it was a joy to put on some ridiculously upbeat music and lose myself for a focused, rewarding half hour. Forming the final shape took some time, and I am definitely glad I tried it first before attempting it on more expensive, one-of-a-kind paper. Remember the ubiquitous 1970s acrylic photo cube? 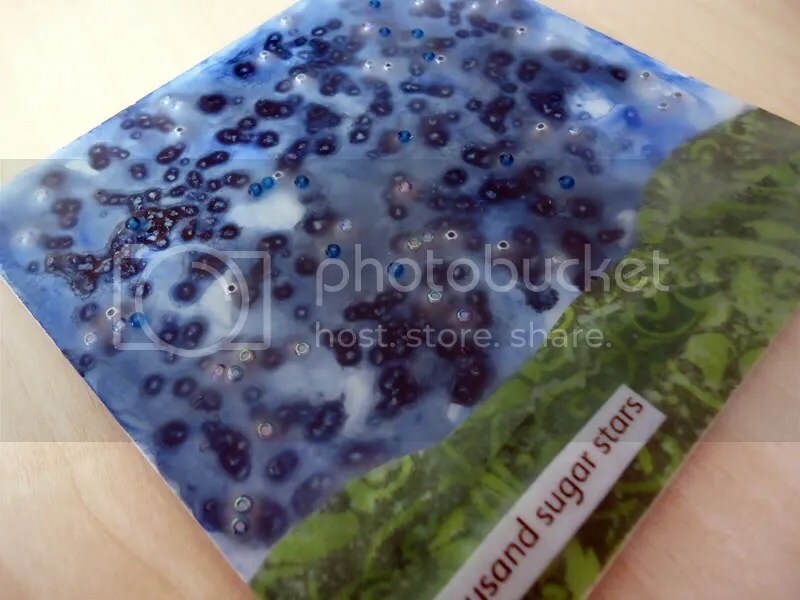 It had a clear plastic outer layer and a spongy cube in the center, between which you could slide five of your favorite snapshots for fashionable, easy display. 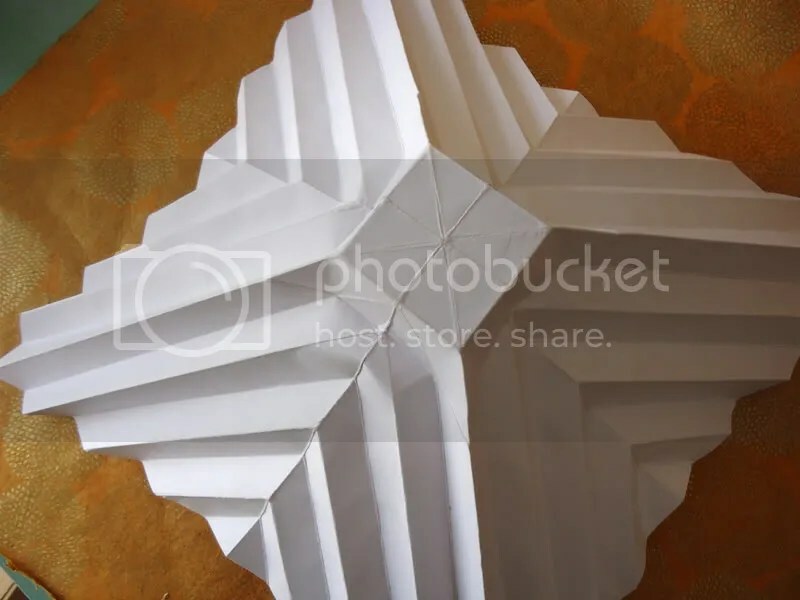 My grandparents had one in their living room, and I remember twirling it from one side to the next to look at the pictures over and over again, as if they might change on the next turn. My favorite photo in the cube was of my grandpa and I: he resplendent in a silvery blue leisure suit, I perched on his lap in my favorite Snoopy shirt. He was a gentle, charming man with brilliant white hair and thick-rimmed glasses, and I was a preschooler with blonde ringlets and a ready, crooked smile. He loved to tell cheesy jokes, and I loved to hear them… we were a good match. Twenty years later, at his passing, I found the same photo cube sitting on the side table. The colors in the picture were faded to shades of green and umber, but he was still there, with the same smiling, twinkling eyes. I wish I had kept that photo cube; I wish I had known things like that would matter so much more some day. 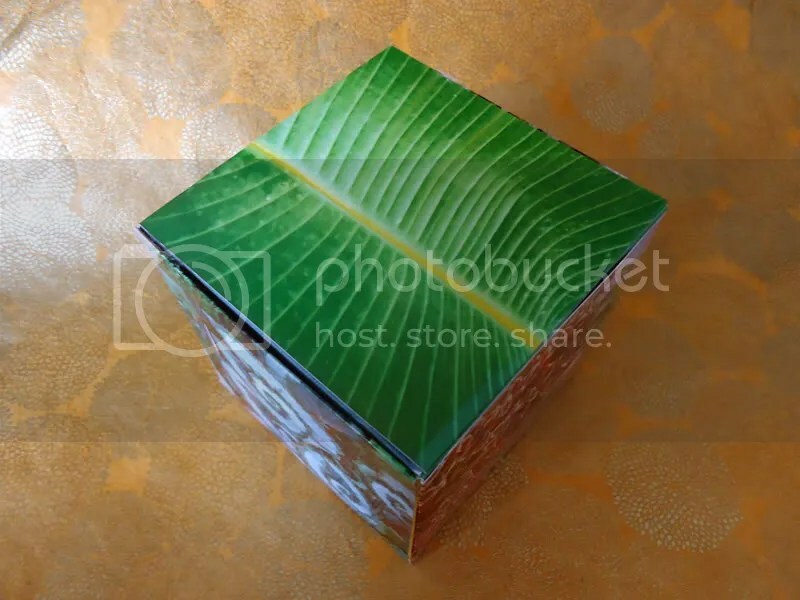 I couldn’t help but feel nostalgic when I saw a photo cube project in Trash Origami. 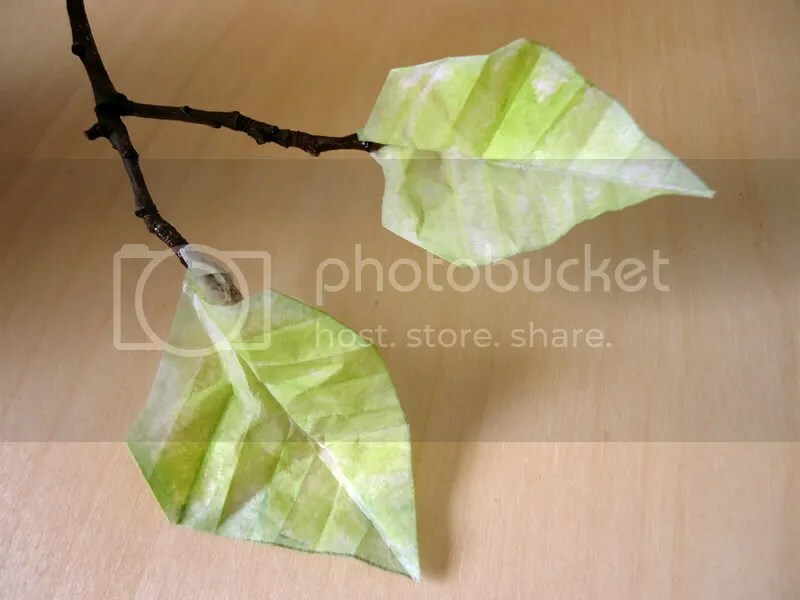 Unlike the original, this one is made entirely of paper, but it is the same concept. 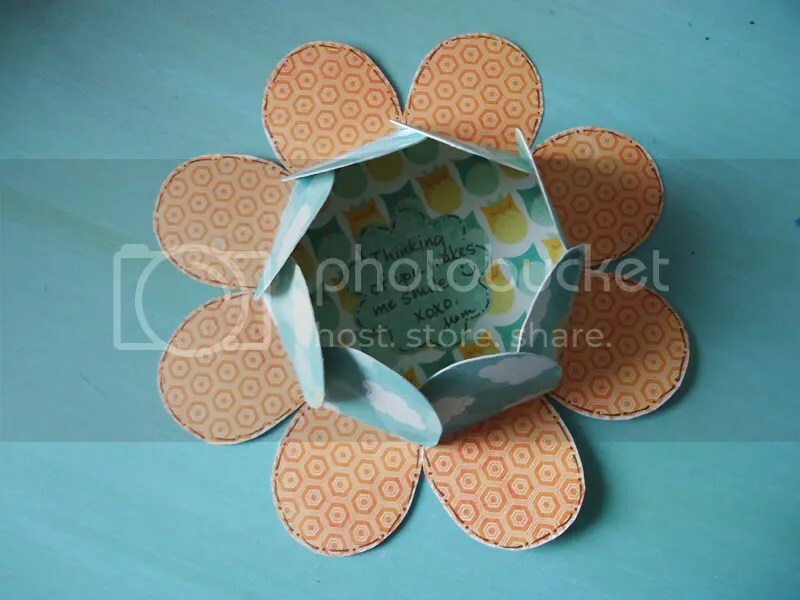 In the origami version, the inner structure of the cube is formed from six photo-size pieces of thick paper — I opted for cardstock scraps, but you could easily use old postcards. 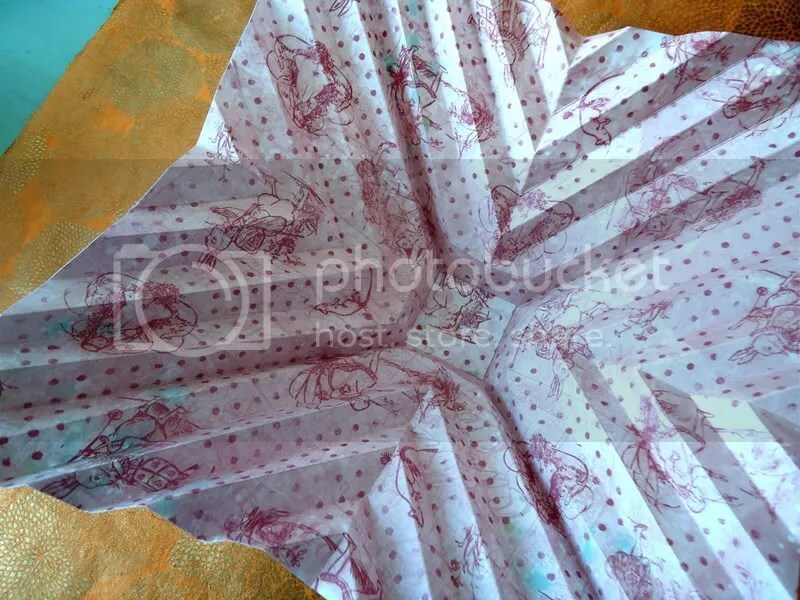 A few simple folds layer them together without any adhesive. 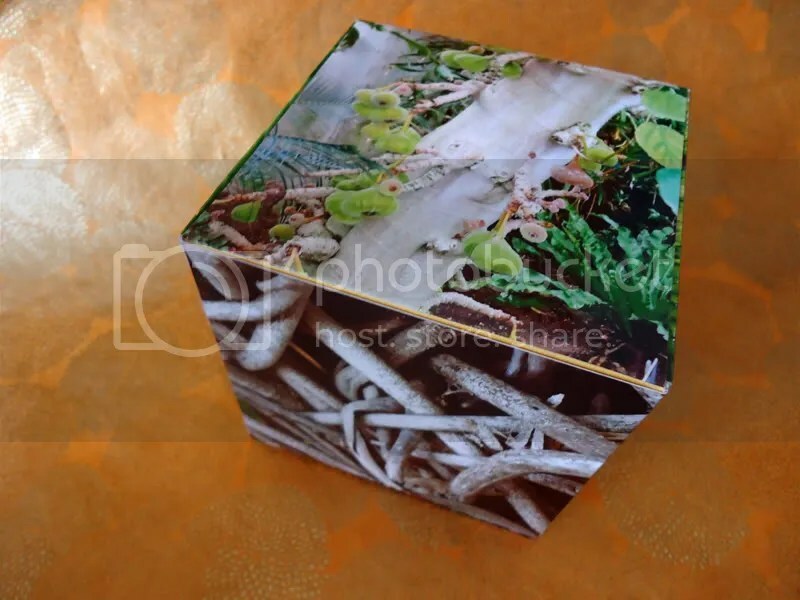 The cube’s outer layer is made from folded photographs which serve to lock the structure in place. I used 4″x6″ prints from our visit to a San Diego botanical garden this fall. I thought it would make for a welcome bright spot in the midst of my husband’s thoroughly taupe cubicle. 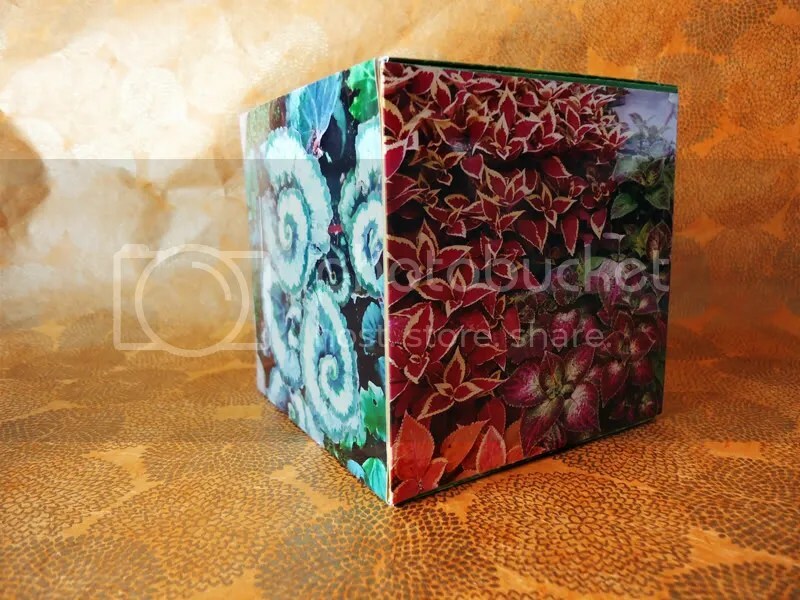 I love the variety of textures and colors the plants provide, but the cube could just as easily display snapshots of a new baby, honeymoon pics of the newlyweds, or photos of you and your sweetheart for a custom valentine. “Are you sure?” asks his buddy. Poke him in the eye. What do you call a fish without eyes? 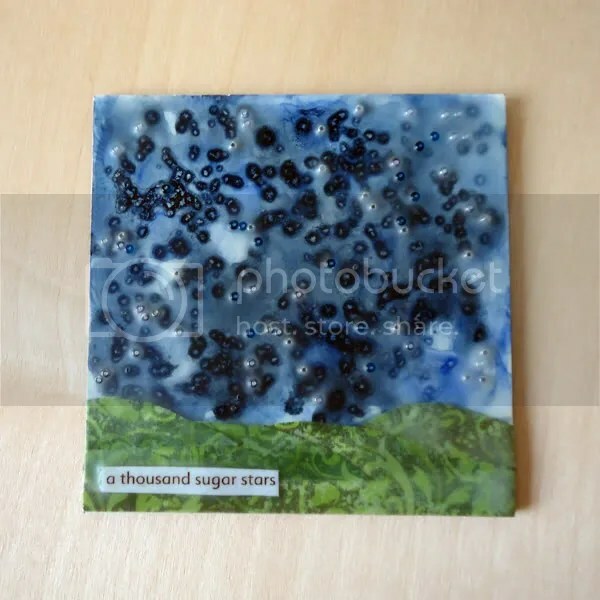 When I first saw encaustic artwork years ago, I was immediately infatuated. I love the way the layers of wax bring depth and texture, and you can embed almost any multimedia object in it. However, it seemed too complex and cost-prohibitive to even consider trying. There was also the space-planning issue. At the time, my “studio” consisted of a table in the corner of our master bedroom, and it would have required some drastic changes to make room for all the encaustics materials. 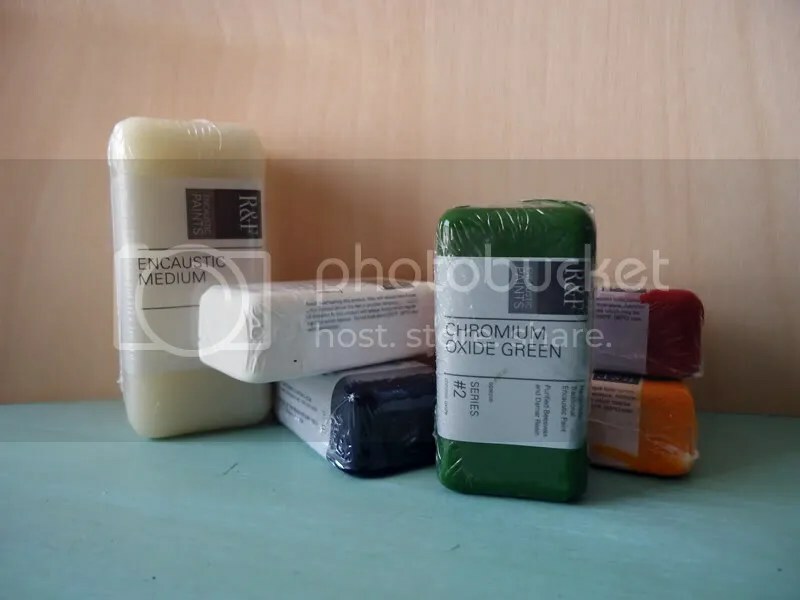 There were only two items left in the room that could be exchanged for more art workspace; since I was fairly accustomed to sleeping in a bed and also pretty attached to my husband, I opted to put my adventures in wax painting on hold. Fast forward eight years, and a lot has changed. (not on the husband front — I mean space-wise :) I actually have my own room in the house devoted to creating art, and the price of encaustic art supplies has decreased as the medium’s popularity has grown. When I realized that I could use an electric griddle in place of a more specialized (read: expensive) heated palette to melt the wax/resin mixture, I decided to take the leap. If you’ve read more than a post or two on this blog, then I bet you can guess my next step: I went looking for a book to find out more. 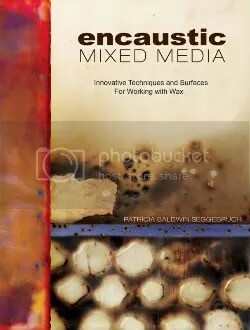 Patricia Seggebruch is one of the first wax artists I encountered years ago, and her newest book, Encaustic Mixed Media: Innovative Techniques and Surfaces for Working With Wax, was a great starting point. 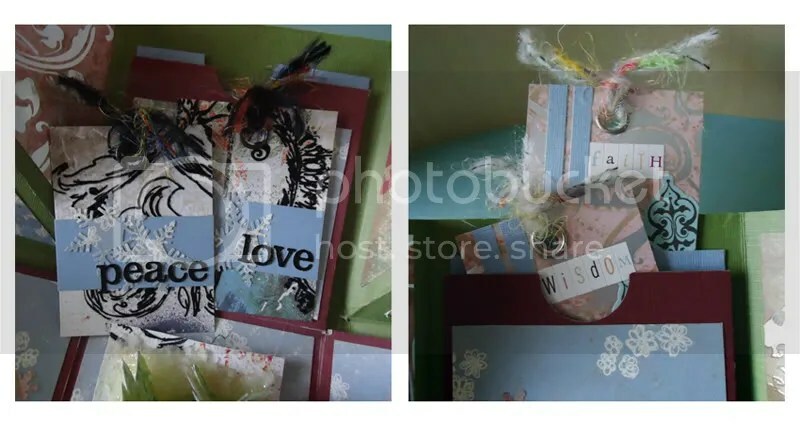 Over the past few years, she experimented with a variety of techniques and media beyond traditional applications, and her enthusiasm about her discoveries is definitely contagious. I decided to start small, a 4″-square collage with watercolor, paper, wax, and tiny beads. “A thousand sugar stars” felt like the perfect title for a piece of art created on the heels of weeks of late-night holiday baking. I scattered coarse salt over the wet watercolor sky to create crystalline stars, then added a paper landscape in the foreground. Next I painted on a few layers of wax and sprinkled on some royal blue and pale pearl glass seed beads. 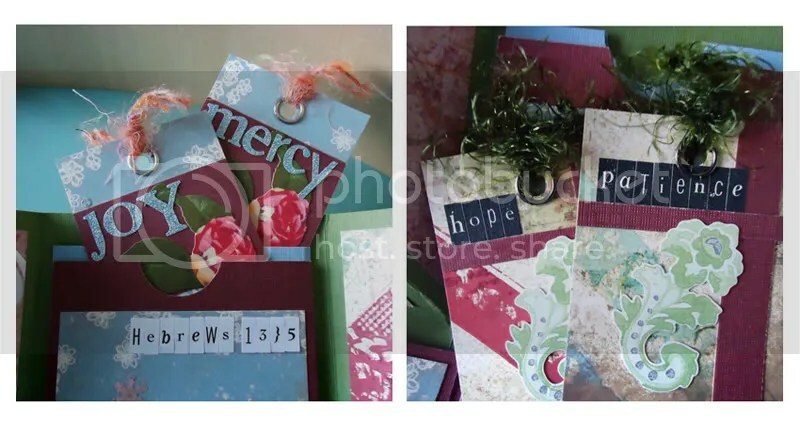 As we get back to our normal work and school routine around here, I thought I would share one last holiday-themed project. 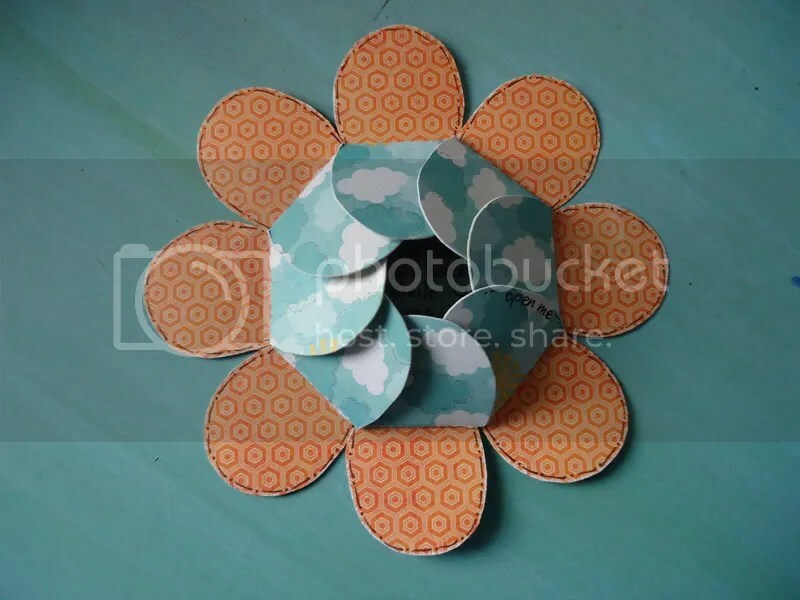 If there was such a thing as Paper Craft Engineering 101, this would be the final exam. 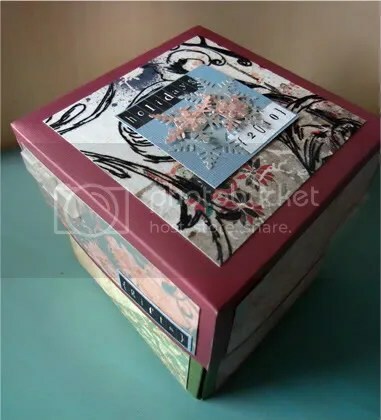 The 4″-square box, lid, and double layer of pockets inside are made from four single sheets of cardstock, scored, cut, and folded to form the structure and its contents. When you remove the lid and unfold the box, it transforms into four pairs of pockets. Each pocket holds a decorated, removable tag. 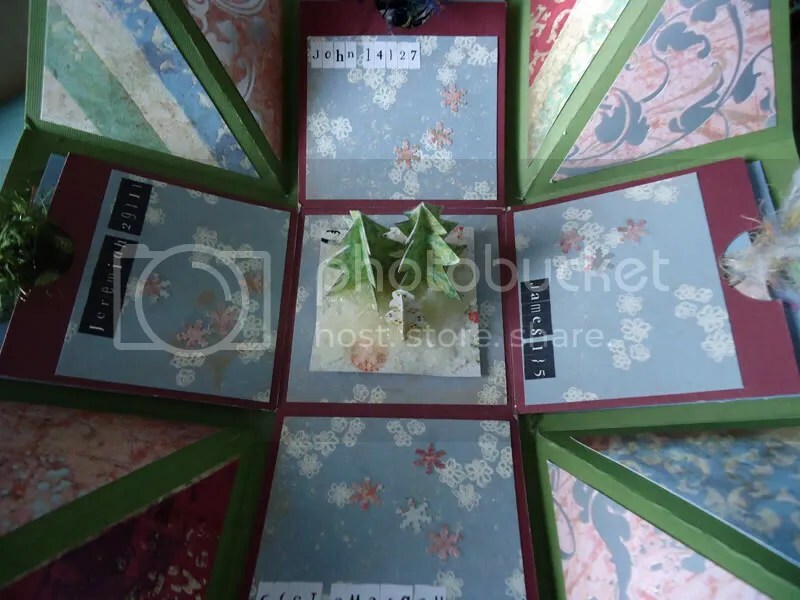 The center forms the perfect hideaway for a miniature winter scene made from paper and gel medium. 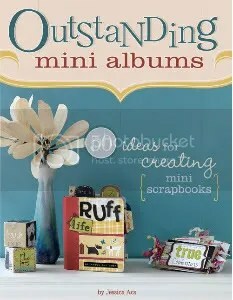 The template measurements for the gift box came from Outstanding Mini Albums: 50 Ideas for Creating Mini Scrapbooks by Jessica Acs. 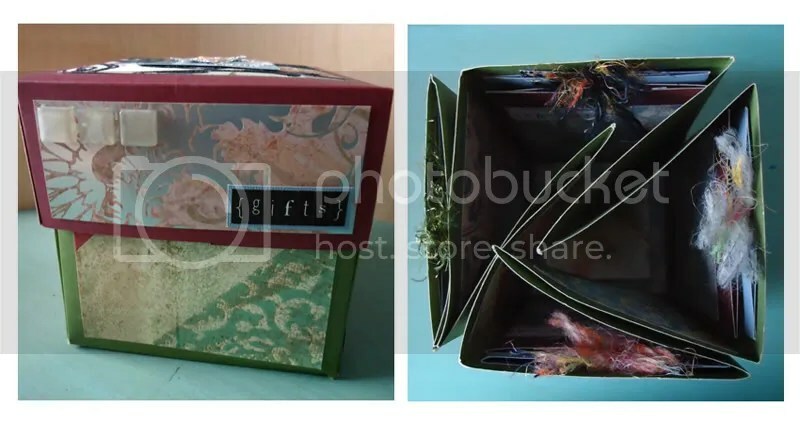 The rest of the projects featured in the book are more traditional scrapbooks, and this could easily be used as a keepsake album with pictures on the tags. It would make a fantastic birthday gift or present for new parents. You could also use the tags to record words of advice for newlyweds or wishes for a graduate.